The Charity Donation Period has ended. Thank you to those who took part. Bring home Argi today and support Ebola relief in the process. This impossibly cute little new pet will jump into your heart and nibble at your Blue Woolen Socks. She’s ready to help guide you through the savage lands of Draenor, climbing, swimming, and running wherever you go. For every Argi pet purchased between December 3 and December 31, 100% of the adoption fee ($10 in the US; pricing varies by region) will be donated in support of the American Red Cross to assist in Ebola relief efforts in Africa. You can also pick up Argi in a special bundle* with the new Grinning Reaver in-game mount, and still help out this great cause. Dart through the skies and skitter across the land on this primal prodigy—and when the mood strikes, let your own grin mirror the reaver's sinister smile. 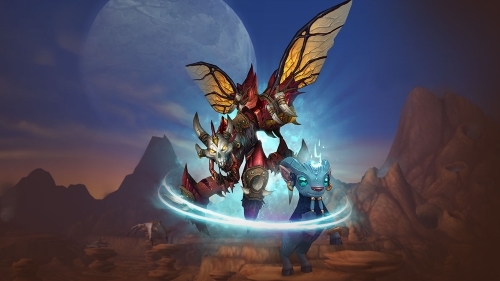 *For every Argi pet and Grinning Reaver mount bundle ($30 in the US; pricing varies by region) purchased between December 3 and December 31, Blizzard will donate $10 ($10 in the US; pricing varies by region) in support of the American Red Cross to assist in Ebola relief efforts in Africa. The American Red Cross name and emblem are used with its permission, which in no way constitutes an endorsement, express or implied, of any product, service, company, opinion, or political position. For more information about the American Red Cross, visit www.redcross.org.